Chiang Mai is Thailand’s second biggest city. Below is a summary of what the city has to offer. 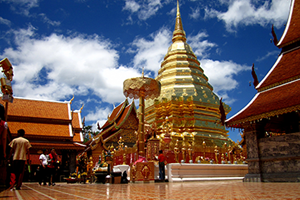 Chiang Mai is the largest and most culturally significant destination in Northern Thailand. It is the perfect base to discover the ancient Lanna culture of Thailand. The city is situated along the peaceful Ping River and centered around the ancient city surrounded by a moat and vestiges of a fortified wall. Four main gates on each side give access to the old section of the city. The foreigner friendly city of Chiang Mai is very easy to navigate for even the most inexperienced traveller. It is one of the fastest growing cities in the region with all the modern conveniences of a city complete with new shopping malls, modern hospital facilities and international cuisine. 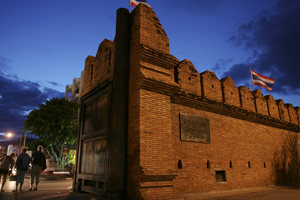 The city also offers a rich cultural side complete with ancient temples, outdoor markets and world famous massage. The holy temple of Doi Suthep offers amazing views of the city from it’s 1,000m altitude just outside of the city. Chiang Mai also offers great adventure tourism with hiking, elephant trekking and white water rafting to name a few. Exploring the surrounding forests and tribal settlements with a local guide is one of the most popular tours. The gay scene of Chiang Mai has been growing quite quickly over the last few years with new dance clubs, show pubs, and entertainment venues popping up all the time. As it is university town the young gay scene is thriving. Chiang Mai offers numerous events and festivals throughout the year. Along with the famous Songkran water festival, the Loy Kratong festival and the Chiang Mai Flower Festival are quite popular. It’s a festive city all year round.